These crispy salmon burger patties start with canned salmon, are super delicious, and are loaded with healthy Omega-3’s. Cooking dinner doesn’t have to be fancy or fresh. In fact, there is no shame in opening a can to start dinner! This recipe is an example of a wonderful creation that comes from a can. 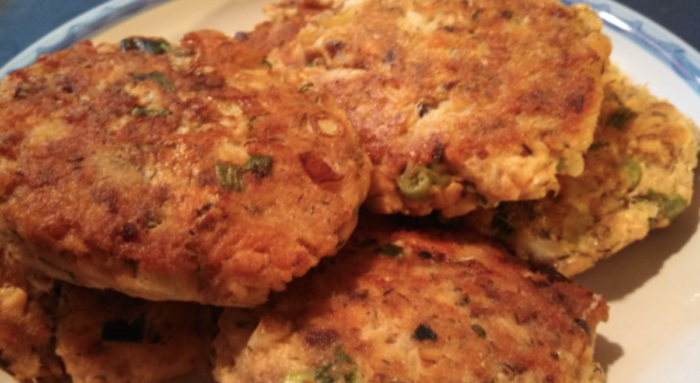 Crispy salmon burger patties are the main reason I keep a couple of cans of salmon in the pantry. 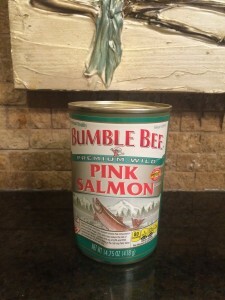 Although fish from a can or pouch isn’t my idea of fine dining, it does have its place~especially when getting to the store to buy fresh fish isn’t an option. Canned fish actually has a few advantages. It is an incredible deal, modestly priced, fully cooked, and shelf stable. With canned tuna or salmon in the pantry, a tuna sandwich or a platter of crispy salmon burger patties can be whipped up whenever the mood strikes. From a health standpoint, canned salmon is chock full of Omega-3’s. One 1/4 cup serving (the equivalent of one burger patty) contains 470 mg of EPA and DHA, which is 294% of the Daily Value. Crispy salmon burger patties are great served with sides such as steamed or roasted broccoli and mac & cheese. The patties also make great salmon burgers or sliders served with ketchup, pickapeppa or tartar sauce, & slaw. Give these a try; you might just discover a new and easy way to get your kiddos to enjoy fish. If so, I’d love to hear back from you!!! Thanks so much for stopping by. Be blessed, and stay savvy!!! Easy, economical and tasty, these crispy salmon patties are also full of healthy Omega-3's. Remove any large bones and skin from salmon. Break into chunks with a fork. Break egg into a large bowl and whisk with fork. Add salmon, bread or crackers, onion, garlic, pepper and additional seasoning. Mix gently. Form into six patties about 1/2-inch thick. Heat oil over medium heat in a large skillet. Place patties in the hot oil in the skillet, leaving the skillet uncovered. Cook, turning occasionally, until both sides are golden brown & crispy.